At address, I like the ‘Y’ shape of my arms and the slight angle my shoulders are sitting at. Already, you can see I have maintained good width and kept my head position fairly centered. 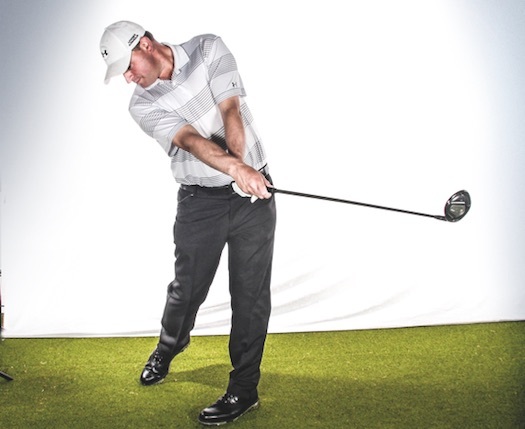 When you start pulling your right arm out of position, you start to manipulate the clubface, and you’ll likely pull it shut. Then it’s basically your hands controlling the clubhead. 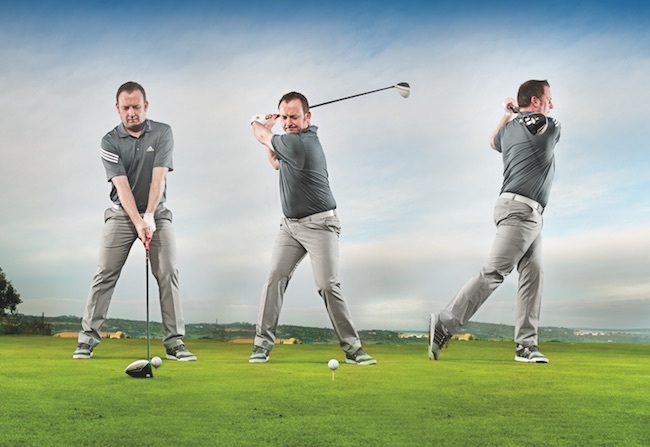 At the start of your backswing, you really do need to get things in the right position. 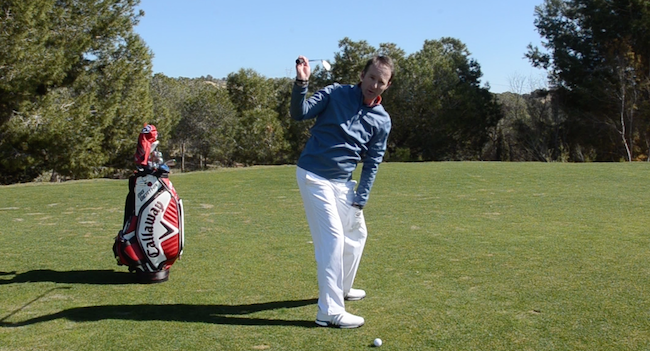 Doing so puts you on track to get the clubhead back into the ball on plane. 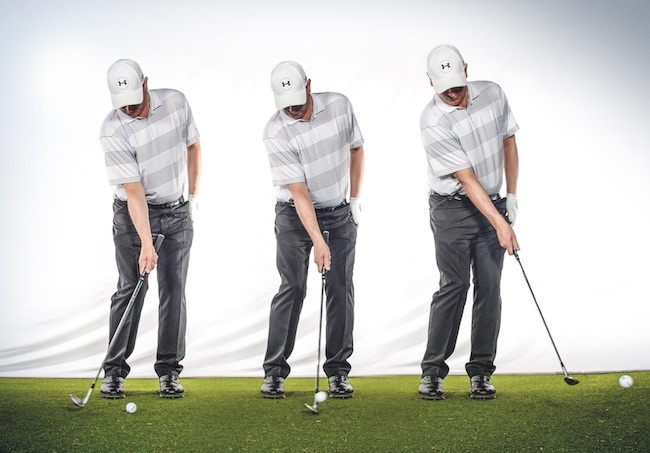 So, at this point in the swing, your arms play a key role in finding that classic position. Here, you want to keep your arms close in to your body (above), with no separation at this point. You don’t want your arms to get too far away, either. Keep things compact. What I’m trying to do is begin my hinge at this point (above, left) and rotate all the way up to the top of my swing. Your upper body should rotate (above, right) twice as much as your hips do. That’s probably the easiest way to explain rotation at this point in the swing. Now, whilst the hands are at the performance end of the golf club, you want to activate the big muscle groups. Under pressure, you want to rely on your big muscles, despite that fact they effectively control the club. Let your big muscles dominate the swing and let your hands be as passive as possible. One of the major mistakes people tend to make when it comes to chipping is using their wrists too much. Most golfers have the urge, for some reason, to hinge too early. On the follow-through, this leads to the right hand working underneath and through, and the strike being very inconsistent through the impact area. 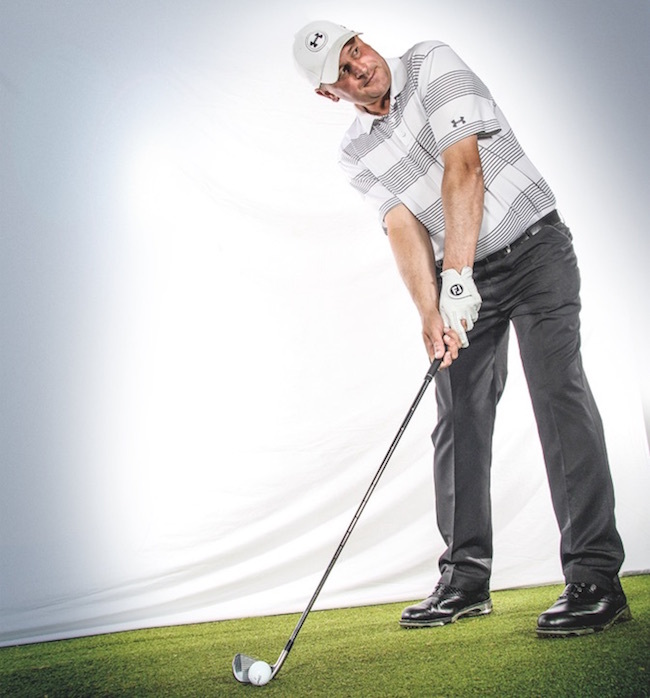 People talk about the ‘low point’ in the swing, where the club makes contact with the ball. If you’re using your hands too much at this point, then your low point will usually occur too early. So, for a chip shot of about 40 yards, you don’t want a lot of wrist action, which is why I do this drill with one arm, not two. It almost forces me to use my big muscles to get through the shot. Doing it one-handed lets you take more control of the shot and gives you more feel, which is why I think it’s a great drill. I’ll do this during practice to get a good feel for set-up, my backswing and what I’m trying to create. I’m set up very slightly open but not by much. 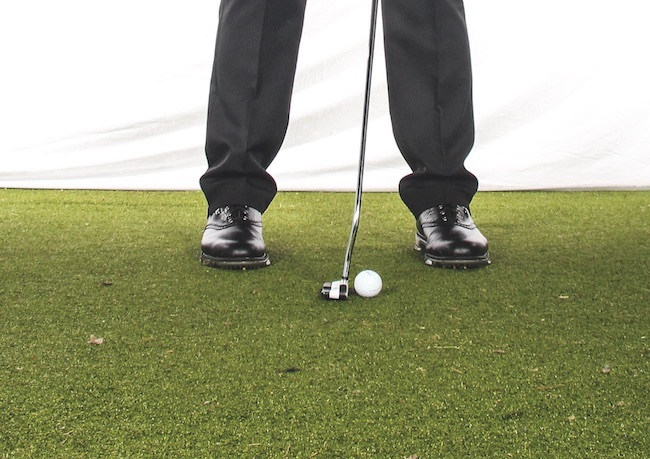 I like to see the feet close together and my ball position right of centre. You can see how straightforward you can chip from here. Normally I would see wrists at an angle, which is poor. I like a flat wrist into the ball. You can also see at impact that I’ve got a nice, relatively flat wrist into the ball at impact. I’ve not hinged massively, which allows me to return to the ball in the right position, letting the loft of the club do the work for me. Being consistent with your fairway woods can be a real advantage because you’ll hit these clubs further than your irons. Again, your arms are key here. I think it’s important to point out that I maintain my eyeline through the hitting area. You can see my right heel is starting to rise up – don’t do this too early – with all my pressure going down into my left foot. I’m also very much moving towards the target and the clubface is square to the target. 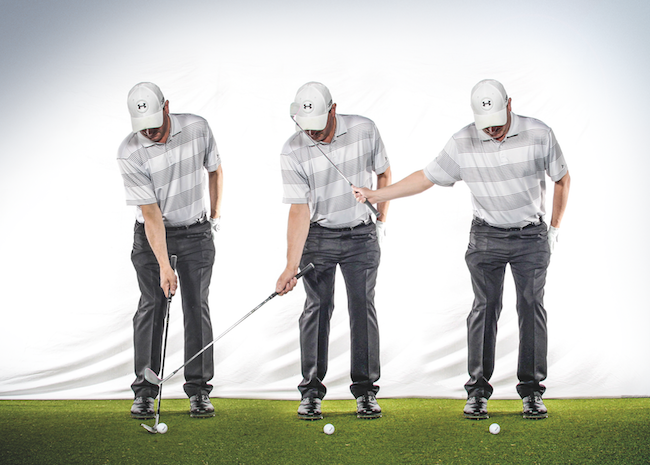 However, the key area at this point with your 3-wood is your arms. What I tend to see from some guys is that, on the way down, the arms start to separate and the left arm bends through the impact zone. That’s a classic fault. I would put people into this position (above), the correct position, then I stand right next to them so that they can’t move into the incorrect position. The big feeling, which will give you the biggest benefit at this point with your 3-wood, is to keep your left forearm straight through the hitting area then continue to extend through. Your right forearm should sit almost on top of your left. 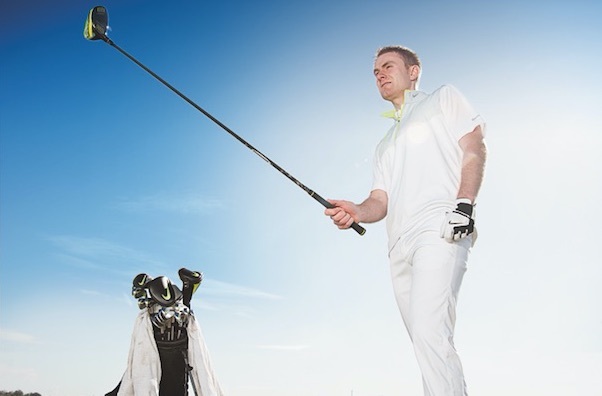 Do that, and you’ll also add more power to your fairway woods. I don’t think there are any absolutes with putting. That’s why you tend to see many different methods on tour. For me, it helps to be able to see lines, move correctly and have a consistent routine. There are no real rights and wrongs; just incorrect positions through impact, which won’t help you. Through the impact area, I like to see people hit up through the ball. 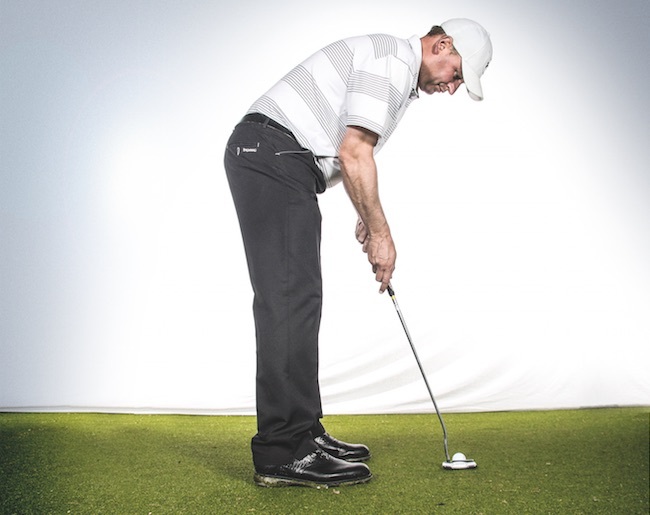 I often see the putter working a little bit down through the impact zone and that just leads to off-centre hits. I’d be looking for the putter to try and stay a little bit lower to the ground but travelling a bit more upwards (below). Having that relationship between the forearm and the shaft keeps good lines in terms of your eyeline and forearm. I like to see good symmetry and you could do this side-on to a mirror at home. The big muscles in your upper body work through the stroke, with your arms in the correct position, allowing you to just concentrate on getting a good movement. Under pressure, you don’t want your hands to be too active. It doesn’t matter what level you are playing at – the less you depend on what your hands do, the better. 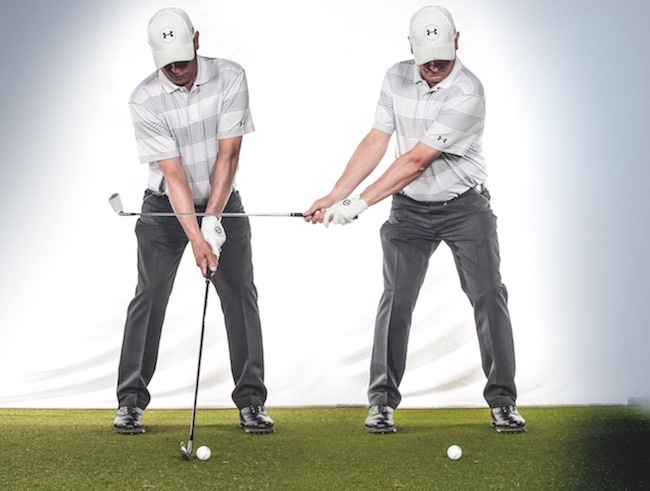 If you rely on the movement pattern – set-up here with your arms – the less you’ll depend on your hands. Do that and you’ll start to see positives in your consistency. David Orr is the Head Professional at Eastwood Golf Club. For lessons, call David on 01355 500285. Follow him on Twitter @DavidOrrGolfer. Originally published on bunkered on September 13, 2016.